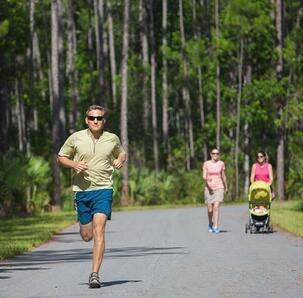 In contrast, most master-planned communities make fitness a priority when planning their community offerings. While some offer recreation through golf courses and pools, many also offer state-of-the-art fitness centers and an array of exercise classes for both fitness fanatics and novices alike. Cross Creek Ranch in Fulshear, Texas, for example, features a large fitness center where water aerobics and yoga are just two of the many classes available to residents. The Arizona master-planned community of Anthem, meanwhile, has both a fitness center and a space reserved for “Mind & Body” activities such as Tai Chi and Pilates. In addition, because master-planned communities are planned from the start, developers often locates such communities near lakes, rivers, the mountains or the beach. Ray says Nocatee’s Northeast Florida location enables residents to stay active, from swimming at the nearby beaches to boating on the Intracoastal Waterway – Nocatee recently opened a new kayak and paddle sports launch – to hiking Nocatee’s Greenway Trails and nature preserve. For more information on Nocatee’s fitness and recreational activities, visit the Nocatee Welcome Center or call 1-800-NOCATEE.